Typically we find that there is a disconnect between Loudspeakers that sound good, and Loudspeakers that look good. Mostly this is because a square sided box is easy to manufacture, and so attention goes into the sound quality. If attention goes into the aesthetics, then this is often at the expense of the sound quality. The FAZON F5 is nothing like the vast majority of loudspeakers on the market. It is the genuine mixture of craftsmanship, performance, and aesthetics to fulfill the dream of a new era’s loudspeaker. Technology is inherited from the DALI MENTOR series with characteristics such as undistorted performance, open sound, and extraordinary resolution. The oversized dome tweeter (28 mm/1.1″), integrating perfectly with 2 x 5″ woofers/midranges, allows dynamics and even the finest musical details to flourish. The visual appearance is stunning and speaks for itself: stylish, daring, and built on a unique aluminium body to ensure extremely rigid construction and minimized reflections. Because of the sophisticated curved shape, the FAZON F5 has no parallel sides, which prevents standing waves from arising. 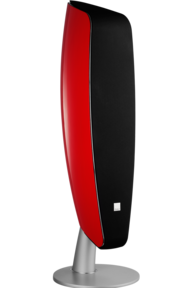 FAZON F5 is the image of future loudspeaker design and performance, matching the varying moods and needs of your day. From sleepy radio listening in the morning, reflecting music enjoyment in the aftermoon, to movies in the evening or partying on a Saturday night. To spell it out: the FAZON F5 unites form and function, gets shape into sound and sound in good shape!